Offers practical and emotional support but not advice, to the mother and/or parents, empowering them in their own choices. DUK members recognise that womens’ choices are valid and that a woman assumes responsibility for the birth, parenting style or feeding method that she feels is right for her and her baby. Works to maintain the highest level of care and support possible, all the time striving to be sensitive, nurturing, empathic, non-judgmental, knowledge-based, flexible, reliable, well-organised, practical and protective of the mother’s/family’s environment. Will accurately represent their doula education and experience and will not mislead other doulas, clients or other birth professionals at any time. Will be honest and show integrity and respect at all times towards their clients, doula colleagues and the other professionals. All doulas will promise to disclose to Doula UK if their circumstances change, or they become subject to restrictions around working with children or vulnerable adults. Is recommended to keep records of all antenatal, birth and/or postnatal support roles with clients. Is recommended to have a contract/letter of agreement with their clients. 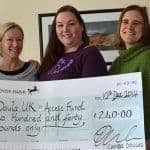 Will strive to attend Doula UK national and regional meetings and contribute whenever possible to the running of the organisation as schedules and other commitments allow. Is aware that whilst Doula UK is able to give emotional support to members, it is unable to provide legal protection. For example: a Breastfeeding Counsellor working with a charitable breastfeeding support and training organisation. All breastfeeding support provided by that organisation is free at the point of contact. Therefore, if the doula is working for the client as a doula, she is unable to act as her breastfeeding counsellor as part of her contracted hours. Whilst she will be able and willing to use her knowledge and skills to support the client’s breastfeeding, if the client requires a Breastfeeding Counsellor, the doula will have to refer her to local support.